A Working Leather Studio is contained within a larger retail space that includes my work and my wife Donna's shop, Sole Shoes. Here you can see a gallery of his finished creations among Donna's treasures while seeing unique and beautiful wallets, belts, and handbags being produced in the Leather Studio. 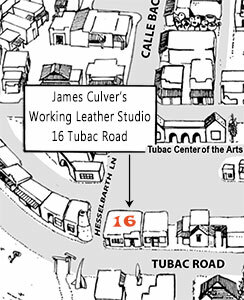 A Working Leather Studio and Sole Shoes are located at 16 Tubac Road on the northeast corner of Tubac Rd and Hesselbarth Lane. See full map HERE.